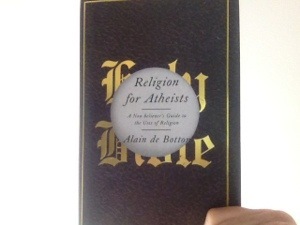 Alain de Botton’s book “Religion for Aetheists” is one of my favorites of 2012. Though the booksesller warned my my hands might burn from reading it (! ), my heart was warmed to a truly inspiring way of looking at religion, using it’s most salient methods and discarding of the outdated and irrelevant ways. Of course the chapter on Art was perfect – describing how effective art has been communicating messages (of good and ill), a sort of moral compass of the times, and how it’s presence always serves to inspire thought and reflection. Alain has both a Ted talk worth listening to, as well as a The School of Life worth exploring.